When the phone rings and wakes you in the dark of the night, sometimes it takes a moment to get your bearings. It was about half-past two in the morning when my telephone rang and woke me in my Chelsea hotel room. I’d been asleep a little over two hours after a five hour plane flight, so it took me a few seconds to even remember I was in New York. I fumbled for my phone on the nightstand next to the bed and answered it. “You were supposed to call when you arrived,” the voice scolded. Sure enough, right outside the hotel there were two taxis waiting. I climbed in the back of the first and he drove me quickly to my destination. He seemed surprised to be paid with cash but happy with his 50% tip. It’s all just expenses to me. I hurried away from the taxi and down into the subway station. Three teenagers were squatting and panhandling about halfway down. 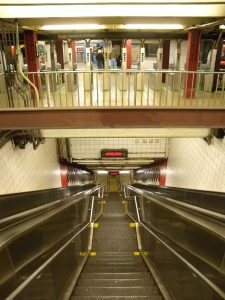 At the bottom of the stairs a disinterested subway cop tapped at his phone with his thumbs. The man I was going to meet waited on the platform. I’d never seen him before but he was obvious. Even in New York there aren’t a lot of people on the subway platform at three o’clock in the morning, and even fewer who are dressed like Doctor Who. I checked around the platform to make sure no ciphermoles were watching and started toward the good doctor. Probably he didn’t intend to look like Doctor Who. Probably he doesn’t even watch Doctor Who. Certainly not enough to know he’s more Matt Smith than David Tennant, and so looks more goofy than gallant in his English suit with white canvas sneakers. The bow tie and fez don’t help a bit either. 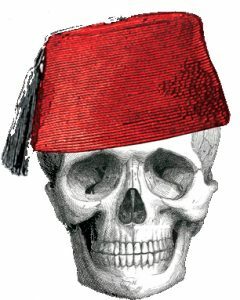 Who wears a fez these days anyway? Just Doctor Who, that’s who, and even that was just Smith. The new one doesn’t do fezzes. Fezzes, per se, are no longer cool. So who wears a fez? 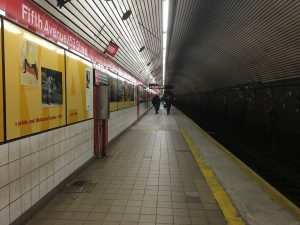 I slowed my approach and doubled-checked the subway platform. Then triple-checked. Where there’s a Shriner, there’s always a ciphermole or two to follow. But I checked every shadow and saw nothing, so I kept walking. When I was close enough for the doctor to see the patches on my leather jacket, he smiled and greeted me. He stuck out a hand and I noticed it was gloved. “I wasn’t expecting you until morning,” he said. There was some noise and commotion over by the stairs. I turned to get a look. The teenagers were apparently trying to move down to the platform to do their begging and the bored cop was having none of it. I turned back to the doctor. This was no good. It wasn’t protection. Just a simple obscuration. So the envoy thought they were being watched. The doctor craned his neck and looked all around the platform. I turned to look at the commotion over by the stairs. The cop had one of the teenagers, a tall white male with long black hair and wearing army fatigues, against the wall. Two women stood nearby, grumbling their complaints about harassment. As I turned back to the doctor, he was standing on his tiptoes and looking toward the stairs. Before I could warn him to be careful of the water, the doctor stumbled out of the circle. I turned to grab him but it was too late. He slipped on the water and almost fell but I grabbed his arms and held him steady. Suddenly an ear-splitting shriek came from the direction of the stairs. I turned my head to look at what I already knew I would see. The two female teenagers were screaming and pointing. I could see what they were now. The hippy-chick guise was just a shell, a simple illusion shell over the twisted and armored body of a ciphermole. “What is that?” the doctor stuttered. “Someone who’ll be having us for dinner if we don’t get away from here.” I wondered how soon the train would arrive but knew it wouldn’t be soon enough. The cop was going to help by slowing them down. Already he was drawing his handgun with his right hand while keying a radio with his left and shouting for backup. His eyes were on the girls, or rather the former girls, and he forgot about the guy he was frisking. The guy in the army jacket held a long knife in his greasy hand and brought it up over his head, unseen by the frantic policeman. The guy was just a scag, fortunately, just a stooge for the ciphermole. I say “fortunately” because no one has ever gone up against three ciphermen and lived to tell about it. Obviously, I made it because I’m here to tell the story. But that doesn’t mean it wasn’t close. Ciphermole have had exotic surgery done on them so their reflexes are twice as fast as a normal human. They pay for this with muscle spasms that twist their bodies so they have to wear special armor for skeletal support, along with a metabolism that requires the occasional consumption of fresh human organs. Needless to say, as foes they are as capable as they are repulsive. More than one agent has been brought to an untimely end by an unfortunate encounter with ciphermen. Lucky for me, the cop got off one shot as the goon stabbed him in the neck with the knife. The shot was true and hit one of the ciphermole in the chest. He went down but probably not for long: not only was their armor tough – it was self-healing and medicating. In just a few seconds, that ciphermole’s wound would gel over and the bleeding would be stopped. His suit would inject him with some arcane alchemy that would revive him and invigorate him. Using conventional firearms, you have to hit a ciphermole several times with magnum loads to put it down. At the sound of the gunshot, most of the half-dozen or so people nearby on the platform hit the deck. The ones at the other end ran for the stairs down there. Someone started screaming and someone further away a baby began crying loudly. The scag yanked the long knife from the cop’s neck and a gout of blood shot into the air. The policeman with down with a long moan and a whimper. The standing ciphermole was checking its fallen buddy while the scag teenager knelt down and sliced open the policeman’s belly. “Oh my god,” the doctor whimpered. He fell to his knees and vomited on the platform. Well, he wasn’t going to be any help. “We have to get out of here, doctor,” I said, grabbing his shoulders and trying to help him to his feet. He was going into shock and his legs were like rubber. As I tried to get him to stand, I could see the freak with the knife heading toward us. The able ciphermole shouted something at him and the scag stopped his approach. They were holding back for some reason, hesitant to take us on without their full team. I struggled with the doctor for another three seconds, about half the time I had before that other ciphermole was on its feet. The doctor’s eyes were glassy and his breath was shallow, so I knew he was no good for walking. Even in my younger days I couldn’t have carried him. I let go of him and he crumpled to the floor. There was no way I was getting out of this without a fight. “Do you have anything that can help me?” I asked him. The doctor looked at me, his eyes glazed. When I slapped him, his eyes rolled back into his head. So I slapped him again. He blinked and looked at me with surprise. The doctor blinked. “I’m not sure,” he said. While he patted his pockets I turned to look at our antagonists. The fallen ciphermole was being helped to his feet by its companions. When I turned back around the doctor was holding a small silver flask. I smiled and took the flask. Opening it, I sniffed the contents and then lifted it to drink. “Three is my lucky number, ” I told him. Before he could protest, I took three quick sips. The brandy was sweet and smoky. It tasted like revolution and burned inside me like a peat fire. I turned to face the ciperhmoles and their goon. They were approaching cautiously. Maybe they knew about the brandy. They looked at each other, puzzled. “I guess you didn’t see that movie,” I said. Clenching my fists, I readied for their attack.